According to a quote by a famous American computer programmer, Bram Cohen: “My favourite language for maintainability is Python. It has simple, clean syntax, object encapsulation, good library support, and optional named parameters.” By considering the popularity of the Python language, we can conclude that the above statement is completely true. Entrepreneurs and developers both have their own justified reasons to love this object-oriented language. Most of the enterprises and startups hire the highest-ranked python developers to establish a robust web presence for their brand in the form of influential web apps and sites. 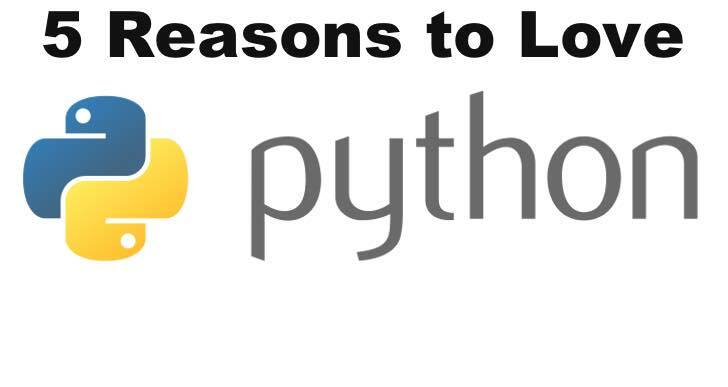 Let’s analyze the top five reasons to love python programming in this article and try to understand the main reasons for its immense popularity. In general, coding is considered to be one of the toughest tasks. Fortunately, Python has changed this perception completely. Most of the aspiring programmers love this language and prefer sticking to it over the others. The syntax of Python is simple and can be easily read by people who have no coding skills. Python code is easy to understand and straightforward. This is the reason why most of the developers have fun when working with this language. This is the language that can make programmers happy and comfortable in situations they feel disappointed by other languages. According to Github’s 2016 report, surrounded with Java and Ruby, Python is the third most popular language that is being used nowadays. Complementing to its immense popularity, there is a passionate community that serves as a backbone to the language. Also, there are several tutorials available that make the task of learning Python much easier for the developers. For instance, you can begin with exploring websites that teach Python and can gradually move on to spending time in understanding these coding games that can teach you interactive ways to brush up your coding skills and expertise. In addition, there are several online courses available that can take you from Python beginner to pro level. Also, in case of any difficulty, the programmers can check out articles that have tips for mastering any new programming language. With the help of dynamic typing, strong typing, and a lot of built-in languages features there is no need for Python developers to write lengthy code. Therefore, the process of web app development in Python tends to be super fast and this makes Python programmers capable to transform unique web app ideas into fully functional sites in a short period of time. For example, if for accomplishing something, 1000s of lines of Java code is required, the same task can be done in under 100 lines of Python code. The only drawback here is that large Python codebases can become difficult to manage. But because of the availability of nifty project management tools, advanced text editors (like Sublime Text), and advanced IDEs (like Pycharm) this hurdle can be solved successfully. In addition, this language is blessed with several libraries and frameworks that programmers can use in accordance with their specific project requirements. Most of the industry giants such as Instagram, DropBox, YouTube, Reddit, and Quora are built using Python. Due to efficient web development frameworks like Django, Python has become one of the most popular languages for back-end development. In addition, this language is also equally popular in the field of data analysis and gives a tough competition to other popular languages in the category such as Matlab. But Python has become the first choice as its open source and available for free. Python code is cleaner, its designed in a better manner, and also has a great support for dictionaries. Also, this language has access to exclusive libraries such as SciPy, NumPy, and pandas. Some other areas where Python is being used extensively are mobile app development, weather simulations, unit testing, data crunching, computer graphics, for automated utility scripts, data visualization, game development, as a scripting language, etc. Since this language is used in so many different sectors, there are several Python jobs available in the marketplace that can be taken by aspiring programmers to enhance their employability in various tech-related fields. Back-end web development is one of the most popular areas where the Python developers can get a position of “senior developer” and can earn up to $150,000 per year or more by working on Django or Flask projects. In case the Python programmers have the required skills, they can also get several jobs in the areas of data science and data engineering. Here, jobs in data science field can give them an opportunity to earn up to $150,000 per year and data engineering can offer them to earn up to $180,000 per year. This means that depending upon the relevant skills and experience, Python programmers can easily grab great jobs in different sectors and these jobs can prove to be a turning point in their entire career with a professional resume template. In the end, it can be concluded that Python programming is useful and there are plenty of untapped opportunities available under its umbrella. The developers can use these resources to build feature-rich and powerful web apps and sites that are capable enough to enhance the digital visibility of a brand.